Don’t let this be the one that got away! Contact seller before someone else does! This car is available as of on the “first one with the money gets it” basis. This message box will be updated when this car is sold. When it's gone…it's gone! This is a very special Corvette so please read the following information carefully because I go above and beyond to give an accurate and honest description. Most of the things I list here would be left out of most other seller's descriptions but I include them for accuracy and because I would want the same done for me. Whether you are new to the world of 1967 Corvettes or have been enjoying them for 50 years, you will find information below that you either never knew or have long since forgotten. Either way, if you study what I have written here, you will be a well-informed buyer and wise investor. After playing with Corvettes and Muscle Cars for 42 years, it is finally time to “thin the herd”. To reduce the size of my private Corvette and Classic Muscle Car collection, I am going to part with at least 5 of the 24 rare cars that I own. One of these cars is my 1967 Corvette Sting Ray Sport Coupe 3x2 Tri-Power 427 - 400 HP - Close ratio 4-Speed - 4-wheel Power Disk Brakes offered here well below market value at $74,900 specifically to facilitate a quick private sale by owner and is available on the "first one with the money gets it" basis. For additional detailed information about this big-block mid-year Sting Ray, please read below or phone me at 217-762-3999. We all know that there are more big block 1967 Corvettes on the road today than were built by Chevrolet in 1967, especially these days with counterfeit documents flooding the market and undocumented “restored” cars with no way of knowing what they were before they were worked over. Ever wonder why some of cars with tons of "documentation" claiming to even include things like their original window sticker sell for less than some small block cars sold through Barrett-Jackson, Mecum, RM (Rob Myers), Russo-Steele, or eBay Auctions? Simple, they were made-up cars that the buyers on the ground that personally inspected them determined the authenticity of that car to be questionable at best, and most likely fake. Just ask yourself, when was the last time you bought a 50-year old car that someone said, oh by the way, here is the original window sticker? Inexperienced people will mistakenly associate the low price these fake cars sold for (and those currently advertised for sale) as being market value for a 1967 tri-power 427 Corvette, then wonder why they cannot find a genuine no-doubt documented car like this one in that price range (or worse, when they get that “freshly restored” car home, why it was that the dealer sold it so cheap). With the exception of the L88 engine option (aluminum head 430 HP – 20 built) and L89 engine option (aluminum head 435 HP- 16 built), the L68 engine option (tri-power 400 HP), is the rarest of them all (only 9% of all 1967 Corvettes built had this option and very few of them came with power brakes like this Corvette did). Here is what we know for sure. When compared to the percent of 1967 Corvettes built by Chevrolet, un-proportionally a far greater percent of cars claiming to be 435 horsepower and 400 horsepower have shown up at the major auctions over the last few years (25% of the cars built were 427 tri-power cars, yet 60% of the cars auctioned claimed to be). Even though Chevrolet built more single 4-barrel 390 horsepower 427 cars than they did 435 horsepower cars, ask yourself, why is it then that there have been three times as many claiming to be 435 horsepower cars than there were 390 horsepower cars at the sales? Interestingly, when only one in six of the Corvettes built in 1967 were 435 horsepower, nearly half of the 1967 Corvettes that have turned up at sales claimed to be 435 horsepower cars. Same applies to the 400 horsepower cars – the 18% that have turned up at auction is double the 9% actually built by Chevrolet. Even more telling is that even though 300 and 350 horsepower cars made up almost TWO THIRDS of all cars built, they represent less than ONE THIRD of the cars that show up to auction. Without fake cars, the numbers that show up would naturally be proportional to the number actually produced. Obviously there has been a shift. The missing small block cars have turned up as heavily optioned big block cars. Now you know where all the small block cars went and why there are so many 435 horsepower cars selling for less than a documented 350 horsepower car. But you say, a car you are looking at has a Bloomington Gold certification, NCRS Top Flight, Vettefest Gold Spinner…so it has to be a genuine 427 car right? WRONG! Bloomington Gold certification, NCRS Top Flight, Vettefest Gold Spinner, Triple Crown/Diamond, Bowtie, Duntov and other similar certificates or awards are COMPLETELY MEANINGLESS when it comes to actually determining authenticity of a car. These types of condition certifications only mean that all of the parts on the car TODAY are correct for the car as it is being represented TODAY. It is not at all unusual for a car that rolled off the assembly line originally as a base engine Corvette, to have been transformed during rebuild into a big block “numbers matching” (i.e. non-original) engine, Bloomington Gold, NCRS Top Flight car, meaning that TODAY it has all the right stuff, with absolutely no reference whatsoever to its original heritage. While many of these cars are stunning clones, the judges never certify them to actually be 427 cars that were produced by Chevrolet. Some are, but statistically 2 out of 3 (62%) of them are fakes. This car needs none of the above because within minutes of looking this car over in person even a novice Corvette enthusiast can immediately recognize that this is the real McCoy and that no dealer has touched this car since September of 1966. Forget about all the fake "clone", "recreation", “replica” “tribute” or whatever new term the scammers have dreamed up lately to call imitation counterfeit vehicles and other undocumented 427 cars you see advertised everywhere, what is an INDEPENDENT THIRD PARTY VERIFIABLE AND FULLY DOCUMENTED actual barn find 1967 Chevrolet 427 Tri-Power 3x2 Corvette Sting Ray like this one worth? The bid amounts below do not include the 10% buyer’s premium paid in addition to the bid amount. Obviously the cars that did not sell at the high bid amount are worth more or the seller would have accepted the high bid. Very few documented 400 HP 1967 Corvettes have been offered for sale over the last couple years (everyone is holding on to what is one of the best investments going these days). While the undocumented (i.e. fake) cars are often highly optioned, the fact is that Big Block Corvettes in 1967 were seldom ordered with very many options. 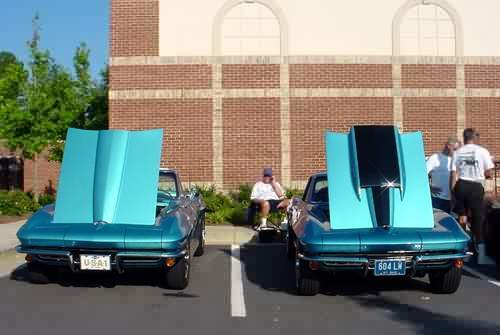 Basically there were two types of Corvette buyers in 1967, those who wanted all the comfort features and were usually satisfied with small block power and others who choose to spend their money on options that would make the car go fast. Seldom did the two meet. In 1967 only 37% of the Corvettes produced were Sting Ray Sport Coupes and with this being one of less than 778 sport coupes originally produced with the 400 Horsepower 3x2 Tri-power engine option, and less than 162 of those having been factory equipped with power brakes this Corvette would be rare enough, but if you factor that only 6% were Lynndale Blue, this Corvette may be one of less than 10 Corvettes produced in this configuration. Of those 10, I do not know how many came with this stunning Teal blue interior, not to mention that only 29% had tinted windshields and only 27% had the 3.70 performance rear axle that this Corvette has. This piece of Corvette history has occupied the number one bay of my climate-controlled shop for the last 28 years (since January 21, 1989). Prior to that is sat in the original owners barn since it was parked there in 1977 when the front end was damaged. Other than the 2.5 hour trailer ride from its original owner’s garage to mine, this Corvette has been indoors 24/7 every single day for the last 40 years (80% of its life). Front end damaged 40 years ago, stored ever since 1977. I am the second owner and this is the first time this Corvette has EVER been offered for sale (car was not for sale when I convinced the original owner to sell it to me 28 years ago). The damage to the front end is contained to the fiberglass above and in front of the front tires and did not get into the cowl area. The doors still open, close, and seal like new. To look at this Corvette in person is like stepping out of a time machine that would take you back to 1977 and finding a virtually untouched 10-year old big block Corvette (even the original owner’s 1977 license plate is still on this Corvette). Without a doubt, one of the most sought after and collectible cars on today's market is the 1967 big block 3x2 Corvette which is always in the top ten sales results of any collector car auction simply because it is the undisputed king of all Corvettes and of one of the fastest factory production cars ever built. This is a very rare opportunity to own one of the most sought after Corvettes ever produced. If you want to drive your investment, this is the Corvette for you. Other than the rare and desirable Lynndale Blue color with bright blue interior and TRI-POWER 427 engine combination, one of the most important aspects of this INVESTMENT QUALITY Big Block Corvette is its documentation and the indisputable fact that it is the real McCoy - a rare genuine 427 3x2 Corvette. Of the 10 colors available on the 1967 Corvette, only two are any more rare than the dazzling Lynndale blue and even more rare is the stunning teal blue color interior. Every day fewer and fewer worthwhile unrestored original Corvettes like this one are left to be found and restored. Even after 65 model years of Corvette production (there was no 1983 model due to moving from Saint Louis to the Bowling Green assembly plant), the 1967 Corvette 427 Tri-Power is the most desirable and sought after of all Corvettes and always will be the single most collectable. Add the extreme originality, documentation, and low price to the equation and the only reason not to by this Corvette is that you are not serious about owning a legend or are under the belief that Chevrolet will resume the production of 1967 Corvettes. If owning a real McCoy investment grade Corvette is not important to you than I recommend that you pick up a base engine small block car with a shiny paint job and stuff a big block into it....but be in for a shock if you ever go to sell it as undocumented "Clone" cars sell for a fraction of a real Corvette like this one. A Corvette is only original once and today's Corvette collectors often prefer their investment grade cars unrestored, in what is called "preserved" condition, looking every bit as old as they are. Most Hi-Performance Corvettes have had their engine compartments stripped and refinished so many times, that even the car doesn't know what was original, let alone the owner. Since this Corvette has not been "restored" or modified most everything is still in its original location and finish, further documents the authenticity. All of the cars in the Shreffler collection are of irrefutable authenticity. In addition to the fact of traceable origins and documentation, none of these cars has ever been re-bodied. They were never lost to time, they have not been built around a roof panel, or a firewall, or a front fender, or a trunk lock. They are the real cars that went down the assembly line exactly as they are represented today. This is a well-documented original 1967 427 3x2 Corvette. The value is in its history and originality. This Corvette is a bargain because it is real. There have been several rare cars brought back from the dead with less than 2 square feet of original body panels (or what is left of a fire damaged bare frame) and then sold for hundreds of thousands of dollars. They are beautiful but they are clones. They are being found out and shunned at the auctions when offered for resale. As the seller correctly points out for his completely redone clone car in his listing eBay listing #260802946587 “Also if I had doc’s, you know I would have listed it, and the starting price would be 100 K more.”. While the Corvette in my listing can be repaired or restored, his clone car can never be a documented original 1967 Corvette 427 Tri-Power. The documentation alone my car has is theoretically worth 10% more than the buy-it-now price on this car. Do an Internet search and you can buy fake documentation for any car -- one look at this Corvette and you know beyond any doubt that it is the REAL DEAL factory original big block 427 Corvette. While everything on a 1967 Corvette can be replaced or refurbished, one thing the others can never have is their documentation that no longer exists.....well sort of as there are counterfeit documents out there, but one look at this Corvette in person, it is clear even to a Corvette novice that this Corvette is the real McCoy.....no need for slick talk, tricky verbiage or games here. I assume you are interested in knowing all the same information I sought when I bought this 427 Tri-power Corvette. In the pursuit of my car hobby, I have been on enough "wild goose chases" due to poor descriptions over the years to value an accurate description. I assume you do as well, so I will be as complete and accurate as possible (no games here). Through my business www.FastSS.com, I have worked with many people that have been misled about a Corvette by a seller just to make a sale, particularly by dealers – especially curbside dealers – people posing as private individuals that are actually full time classified ad car dealers and the “hundreds of Big Block Corvettes in stock” dealers, just to find out later that everything about the car was fake. I have always searched for straight, solid, un-molested, and well-preserved original cars for my collection. Furthermore, I have always preferred to buy a car that had not been previously “restored” as I preferred to see exactly what I was getting and know that it was genuine. In most cases, I have sought cars that came equipped from the factory with as many of the most desirable options as possible (especially special high performance options). I bought this Corvette on January 21, 1989 from the original owner with the intention of keeping it in my collection indefinitely. However, since I have kept buying cars and never selling any, my garage is so full I no longer have room to work, so I must sell a few cars to regain space in which to play with my toys again. As for my personal search for a Big Block Midyear Sting Ray, I found it very difficult to locate a 1967 that had been originally factory equipped with the 427 Tri-Power engine and possessed verifiable supporting documentation. It seemed that all the Big Block 1967 Corvettes I ran across were for sale by dealers and had been recently “restored” (i.e. fake) allowing little or no way to verify authenticity and with documentation that that was questionable at best (as were most of the dealers). Since I preferred to buy from a private party (and preferably a long-term owner), I ran ads nationwide offering a $500.00 cash finder's fee in 1980s dollars ($1,560.66 in 2017 dollars factored for inflation) in over 80 publications for more than three years as well as passing out thousands of car-wanted fliers at car shows to find this Corvette. I even went to the extent of paying the State of Illinois for the records of every 1967 Corvette registered in Illinois, which cost me $600.00 in 1986 dollars ($1,329.41 factored for inflation in 2017 dollars). In addition to the tank sticker, the best documentation any Corvette can have is the original title document showing the 57.8 Taxable Horsepower proving the Corvette came from the factory with a 427 engine, which I still have. I have the original 1967 Indiana motor vehicle title (that back in 1967 further verifies the 427 engine option) and owner's information as well as the original build sheet (fuel tank sticker) which is intact, clearly legible and still on the original gas tank, which has never been removed from the car. A Corvette tank sticker is the broadcast build sheet (also known as the Corvette Order Copy) that is created when the order is accepted by the GM central office before the cars go down the assembly line. Obviously, all of the data on the build sheet on this Corvette matches this car perfectly because the tank sticker is still glued where the Chevrolet factory worker placed it 51 years ago (on or about September 28, 1966) at the St. Louis Corvette assembly plant and the fuel tank has never been removed from this Corvette (see a picture of the tank sticker in the picture section of this listing). Peering past the fuel filler gasket, the build sheet is clearly legible and further documents not only the 427 Tri-Power engine option but all of the other options on this Corvette as well. No questions as to the proper authenticity of this Corvette. I guarantee this Corvette is a real big block from the factory. No games here! Since the tank sticker is on top of the fuel tank which has never been removed from this Corvette, I suppose those who are not familiar with the 1967 Corvette would likely wonder how it can be seen (just as the original owner wondered what I was doing when I looked at the fuel tank sticker for the first time - indicating to me that I was the first one since September 1966 to see it), the original build sheet on a 1967 Corvette is visible if a person opens the fuel filler door, pulls the rubber boot aside and peers down beside the filler cap to the top of the fuel tank with a flashlight. While it was easily recognizable as a 427 Corvette, had I not read the build sheet, I would not have known that this Corvette was originally an L68 427 Tri-Power car....something the original owner failed to mention, but then again not surprising considering that he also didn't mention that the 1963 Corvette split window coupe I bought from him at the same time was originally a Fuel Injected Corvette, until I opened the hood and saw the originally installed FI equipment. When was the last time you saw a 1967 Corvette for sale that was not a "fully optioned frame off restored - 435 HP"? If you add up all those, my guess is that you will find more for sale at any one given time on the internet and through "Dealers" than the total that were produced by Chevrolet in 1967. Add to that how many have documentation (IE Fake reproduction documents = cloned car) and the number grows to a point it should be in Ripley's believe it or not. Then ask yourself, of all the cars YOU have owned over the years, how many came to you with the original build sheet (Corvette + tank sheet) and original certificate of title issued when the car was new....and were able to meet the original owner.....well, personally through my car hobby, I have owned more than 70 cars over the last 42 years (still own everyone I bought in the last 31 years) and I am here to tell you that other than this 1967 Corvette, I have yet to ever have a car that still had a build sheet and other than the vehicles I personally bought brand new, I have never owned a car that came with an original window sticker or title issued when the car was new. I still own 5 of the 7 Corvettes I have ever owned and the two I sold were to bankroll the purchase of this Corvette 28 years ago. This Corvette has been stored 40 years ever since the front end was damaged in 1977. Even the original owner’s 1977 license plate is still on this Corvette. The engine block numbers do not match but the rest of the drive train and Corvette is very original and unmolested including the factory installed original Muncie M21 close-ratio 4-speed transmission and 3.70 to 1 ratio posi-traction BIG BLOCK rear differential are obviously all numbers matching because they are original to this Corvette. Not that it matters, this is a low mileage car as would be expected for a Corvette parked when it was only 10 years old. I do not know if the spare tire has ever been removed from this Corvette. While the original owner changed the engine block, cylinder heads, and pistons due to a spun main bearing, the rest of the bolt-on the engine parts on this Corvette are correct for (and most likely original to) this Corvette, including items like its forged steel crankshaft, connecting rods and 1967 Corvette only unique 427 special valve covers, unique timing chain cover, exhaust manifolds, oil pan, windage tray, timing chain cover, bell housing, brackets, throttle linkage, crankshaft, connecting rods, flywheel, harmonic balancer, oil filter canister, fuel pump, pulleys, starter, timing chain cover, valve pushrods, water pump & etc. Even though the engine block and cylinder heads were replaced long ago (as most 427 engines were in real Big Block Corvettes since the GMAC warrantee only cost a Corvette owner $25 if he scattered the engine), all of the bolt on engine parts are original to this Corvette (for that matter I do not believe the exhaust system has even ever been off of the car - simply un-bolted and re-attached to the engine when the long block was changed). Unlike most small block 327 cars, this original big block Corvette does not have its original engine block, as most real big block Corvettes don't because most 427 Corvette buyers were gear heads, and considering that this was only the third year for the BB, the small block 8000 rpm guys had to adjust to the lower RPM due to valve float of the heavier big block valve train components. Be suspicious of any big block Corvette that is highly optioned -- there were two types of buyers - Hi-Performance enthusiasts and comfort creatures. The Hi-Perf guys didn't care about comfort features (especially if they added weight or robbed horsepower) so the real 427 Corvettes seldom had many other options (same reason most don't have original engines -- most were driven hard and blew up years ago). I know this because I am one of those "gear heads" (I have had the fastest car in my county since 1978) and any option that did not make it go faster was stripped from the car A.S.A.P. Many ordered the big block 427 to make the Corvette accelerate, but often and more importantly for handling and safety, the buyer overlooked the second most important option on a Corvette which is power brakes to get it stopped. This Corvette has the optional 4-wheel disc power brakes. Heaven forbid you can find a Corvette for sale by a seller who actually admits that the block was re-stamped (since august 2002, there has been exactly one 427 Corvette on eBay that admitted a re-stamp - the rest say "numbers matching or worse claim to be "original engine” Corvettes - funny thing is that in 1973, at the first Bloomington Gold Corvette Show (then called Bloomington Corvette Corral) only about half of the big block Corvettes had original engines and by the end of the 1973 oil crisis and embargo, gas rationing, and the 1979 energy crisis, less than 10%...don't take my word, ask others that played with these Corvettes....how many did they see that still had their original big block engines by the end of the 1970s. This Corvette has not been altered other than described herein since 1977...long before "Clones" were even thought about or even remotely profitable. Matter of fact if you remember, in 1977 Big Block Corvettes were shunned due to gasoline prices that had risen to the unbelievable price of 62 cents per gallon (up 72% from 36 cents at the beginning of 1974), only to go much higher over the next 4 years (I know because I had the misfortune of owning a Standard Oil service station business in 1981 when gas was $1.38, which factored for inflation is $3.85 in 2017). While a person could do a frame off restoration, I personally would recommend against it in the case of this Corvette since it is so well preserved due to its proper long-term storage. In my opinion, this Corvette would make a good Bloomington Gold Survivor candidate.  The Corvette is still the original color, Lynndale Blue with the original Teal Blue Interior, which is in remarkable condition. The Corvette came to me with a 1966 425 horsepower intake that I removed since it did not match the car, other than that I believe I all the original parts are on or with this Corvette (including the headlight buckets, headlight motors, broken front-end fiberglass & etc.). The two main options on the build sheet are 400 Horsepower (3x2) and Power brakes. The tank sticker also shows Tinted Windshield, Posi-traction Rear Axle, M-21 close ratio 4-Speed Transmission, WW tires, and AM/FM Radio. The odometer reads 45925, which I believe to be the actual mileage since I bought this car from the original owner who parked it in 1977. I expect the engine needs freshened-up after all these years. I assume most everything does mechanically work, as this Corvette has been garage kept all these years. I did have a midyear Corvette restoration expert look at this Corvette right after I bought it and he said the cost to fix the front end with OEM style fiberglass, strip, and refinish this Corvette would cost less than $5000 ($9,985.16 factored for inflation in 2017). He also said the frame was serviceable and solid. With this Corvette being so remarkably original and extremely well documented, it is well worth the $74.9k price. Since I have owned this Corvette, I have seen others like it change hands regularly in the $135,000 to $150,000 price range (repaired), and it is not at all unusual to see well documented 427 Tri-Power Corvettes like this one sell for well over $150,000 depending on options and providing any restoration work was properly documented. This Corvette is easily worth $200,000 to $250,000 depending upon the degree of restoration. Other than the rare color and engine combination, the most important aspect of this Corvette from an investment standpoint is its documentation and the indisputable fact that it is the real McCoy - a rare genuine 427 tri-power Corvette. 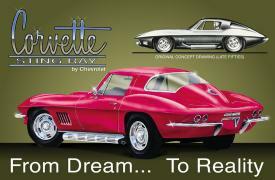 I hold the clear title to this 1967 Corvette for the last 28 years. I welcome the opportunity to meet so you (or anyone you wish to bring or send) can examine this 1967 Corvette personally. This Corvette is available virtually any time for your inspection by appointment, which I welcome and encourage. This 1967 Corvette is located at my home in Monticello Illinois, halfway between Champaign and Decatur Illinois, 1 hour east of Springfield Illinois and 2 hours from Chicago, St. Louis, and Indianapolis. You and/or your mechanic, restoration specialist, Bloomington Gold/NCRS judge, will feel right at home inspecting this Corvette in my fully equipped shop (no high-pressure salesman hovering over you in a dealership showroom). I am a private party selling at least five of the cars out of my personal Corvette and Muscle Car collection and while I am not a car dealer, where applicable, the terms of this transaction shall be in accordance with the Sales Information and Policies of my business. Since this is a private transaction, you will not be required to pay sales tax. All but three of the fine automobiles in my collection are a combination of well-restored and/or excellent original condition. I have owned most of these cars more than half their life, longer than any other person (30-42 years). 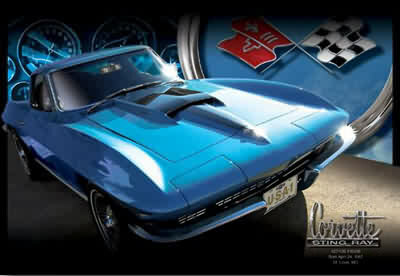 As you might have gathered from this listing and my websites www.SS427.com and www.FastSS.com, my primary involvement in the Corvette and Muscle Car world is and always has been driven by my love for the cars that to me are the ultimate works of art. I am not a dealer (the last time I sold any of my cars before these was 37 years ago and have regretted selling that one ever since). I bought and/or restored each of my desirable collector cars, with the intention of keeping them forever. However, since I have kept buying cars and never selling any, my garage is so full I no longer have room to work, so I must sell a few cars to regain space in which to play with my toys again. Many of you already know me as the founder, owner, and proprietor of Lightning Speed Shop. Chances are we may have already done business by phone or met in person decades before the Internet came along, especially if you attended any major car show in Illinois or Indiana during the 1980s or 1990s when we were very active in the regional car show and swap meet circuit, so much so, that one year the promoters of both Super Chevy Magazine and the Bloomington Gold Corvette Show (the world's largest Corvette event) used half-page photos of our awesome display in their materials to promote and publicize their car show events for the entire year. You may remember me as the guy at the show with the hot wife and all the engine blocks, cylinder heads, intake manifolds, and carburetors (typically 75+ pairs of cylinder heads and more than a dozen Corvette Tri-Power intake manifold assemblies with 3x2 carburators and so much more - 15,000+ pounds of parts on display for sale at every show) which is why ours was one of the most photographed displays printed in countless car magazine articles. Along with Super Chevy Sunday and Bloomington Gold, we were also regular vendors at the both spring and fall Chevy/Vettefest Nationals (world's largest all-indoor Chevrolet and Corvette event) and the Motorama car shows held at McCormick place in Chicago, the Hoosier car show held inside the Indianapolis Motor Speedway at Indianapolis, and the Peotone Illinois swap meet each year. Before the Internet, we advertised heavily in Hemming’s Motor News Magazine, Chevy/Corvette Buyers Guide Magazine, Vette Vues Magazine, and 76 other publications doing 90% of our business with customers worldwide from our shop here in Monticello Illinois, supplying the Corvette and Muscle Car community with engines, parts, and consultation. As a 40-year veteran racing engine builder and restoration engine specialist, I have always focused on hard to find High-Performance Corvette and Chevrolet Muscle Car Engine Parts for use in both restoration and competition for the years 1962 to 1972. Now what's keeping you from being the only person in the world to own such a rare and collectable artifact of American car history? What? You have read all the way down to here and still have not picked up the phone and called. Why not? What are you waiting for? Better refresh this page because someone else may have started reading before you and already bought this car. Copyright © 1998-2017 Shreffler All rights reserved.